Ricky Raley knows all about pain, challenges, obstacles and despair. He also knows how to overcome all of it. Now, he wants to help other military veterans do the same. Raley, a Westfield resident and disabled Indiana Army National Guard veteran, is about to embark on a 1,500-mile handcycle ride to raise money for the Boot Campaign, a Texas-based nonprofit that provides life-improving programs – including innovative and holistic medical care – to veterans and active duty military families. Raley, who suffered a serious brain injury during a 2008 tour of duty in Iraq when his mine-sweeping vehicle struck an improvised explosive device – and became paralyzed from the waist down six months later in an off-duty stateside truck crash — credits the Boot Campaign’s Health and Wellness program for further facilitating his physical and emotional healing nearly 10 years after retiring from the military. He completed the program in June and is now an ambassador for the nonprofit. On Aug. 13, Raley will begin a two-week journey, the “Raley Road Trip: Cycling It Forward for Boot Campaign,” from New York City to Pinellas Park, Fla. He plans to cover more than 115 miles a day on his handcycle, the “Rubber Ducky II,” and raise $150,000 for the Boot Campaign. Rain or shine, hot or cold temperatures, rough terrain or smooth, he’ll cover the entire distance powering his handcycle largely with his remarkable arm and upper-body strength. An avid athlete prior to his military service, Raley, 32, has trained for the ride with the same resolve, determination and perseverance that helped him recover from the devastating effects of his injuries more than a decade ago – a process that involved intense physical therapy, strength training and uncanny drive. 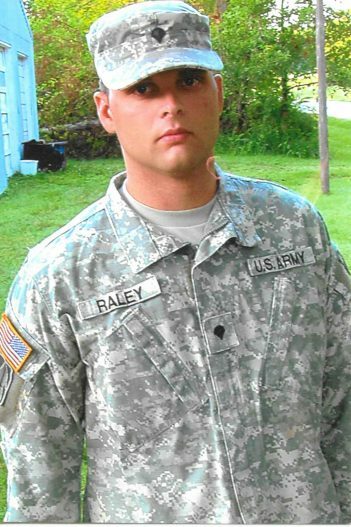 Ricky Raley joined the Indiana Army National Guard in 2004 and suffered a serious brain injury during a 2008 tour in Iraq. 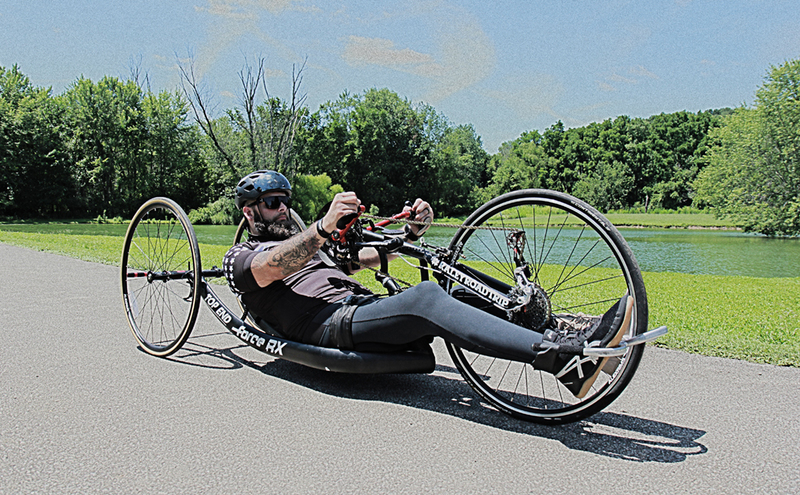 Raley took up handcycling approximately eight years ago, initially as a member of the Paralyzed Veterans of America race team. He completed his first handcycling marathon within a year of his truck accident. Despite the severity of his injuries, Raley’s most difficult healing struggles have been on the psychological and emotional sides. The birth of his first and only son, Pierson, was only five months away when he was paralyzed. Although he became physically active again, Raley continued to suffer from many of the psychological torments, such as depression, post-traumatic stress disorder and isolation, that many veterans endure. At the urging of his wife of nine years, Quynhmy Raley, he participated in the Boot Campaign’s Health and Wellness program, which provides innovative and holistic care for, among other afflictions, traumatic brain injury, PTSD, chronic pain, self-medication and insomnia. Raley emerged from the program physically and mentally stronger and with an entirely new outlook on life. His wife, not surprisingly, is proud of him not only for his courage and military service, but also for his qualities as a father and husband and for his efforts to help fellow veterans. “It says he cares, so much that he goes and does something so crazy that it is going towards a world record in handcycling,” Quynhmy said. “All he has ever wanted from whenever he was paralyzed was to help another individual that was in his similar situation. He has helped countless individuals in wheelchairs, and soldiers, and continues on his mission to spread his kindness. That is precisely Raley’s mission in raising funds for the Boot Campaign. 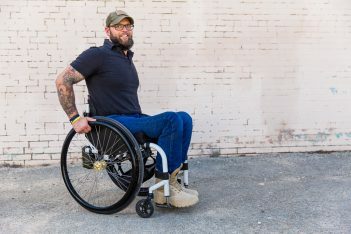 “I hope my ride not only inspires veterans but the civilian population as well so that they have an awareness of what the Boot Campaign’s Health and Wellness program is doing for veterans,” said Raley, who was awarded a Purple Heart after being injured in Iraq. “I hope all these miles I put in will save multiple veterans’ lives and return them to their families whole again, or close to what they used to be. For more or to sponsor or donate, visit bootcampaign.org. Each participant is connected to crucial services according to individual need. Treatment and training programs include scientifically validated protocols for traumatic brain injury (TBI), post-traumatic stress disorder (PTSD), chronic pain, self-medication and insomnia. Depending on the services needed, the estimated cost can reach up to $35,000 per participant. Ricky Raley’s goal is to support up to five veterans through Boot Campaign’s whole person – brain and body – approach to health and well-being.